Once you are done with the RMO picking, you can export the RMO picks of an episode for further interpretation, such as tomography. Take note that you can only export active RMO picks from one episode at a time. In the Imaging tab header, click on the Add icon and select Export Tomo Picks. The Export Tomo Picks window will be displayed. 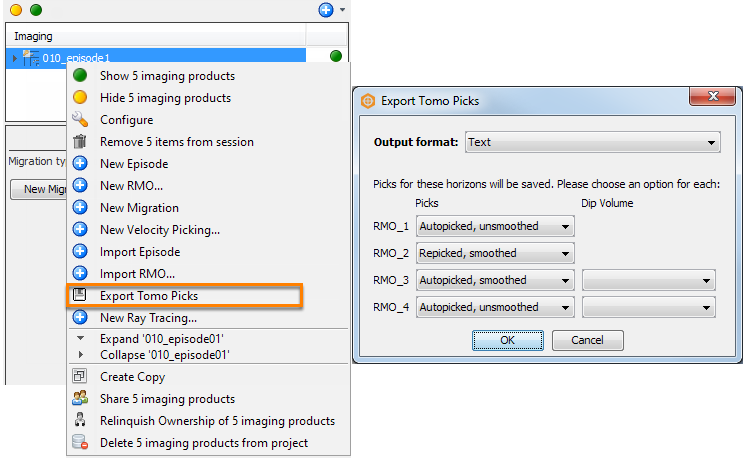 Alternatively, select the episode in the Imaging tree, right-click and select Export Tomo Picks. The Export Tomo Picks window will be displayed. At Output format, select Text or Binary to choose the format for the output file. At each of the RMO items, select the property of the RMO picks you want to export. For volume-based picking, you need to select a 3D dip volume during export (see Dips). Click OK to export the tomo picks in the .tomo file format. By default, Insight will open the 020velMod subfolder in the Project/Imaging/Episode/ directory for you to save the picks. Note: When you save your session, Insight will save the RMO parabolas in the Project/Imaging/Episode/010rmo subfolder in the .para file extension. If you have computed trims, this action will also save the RMO trims in the .trim file extension in the same sub-directory.